Power Systems Exercise Equipment - SpeedSac Weighted Sled Saf-Sled. Free shipping to the lower 48 United States for this SpeedSac weighted sled. Do you need a versatile weighted sled for indoor and outdoor drills? The SpeedSac allows you to fill the sled with up to 40 lbs. 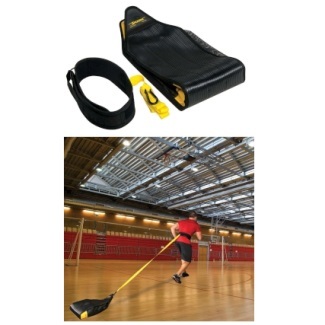 This exercise sled is great for basketball drills and other indoor exercises. Want to do some personal training during the football off-season? Use the SpeedSac to run your own personal exercise regiment wherever you want. SpeedSac speed sled is great for indoor and outdoor drills. Comes with waist belt attachment. Not well suited for rubber floors. Great for explosive, speed, stamina, and conditioning. Orders generally arrive withing 10 business days.